Motor racing scenes on 'The Champion' comics, 1947 and 1948. Homepage. This page: Several copies of this popular comic from the 1940s, featuring cars on their covers. Racing cars on the covers of The Champion comic. A selection of old comics that feature car illustrations already feature on this site, for instance this old copy of Pluck from the 1920s, The Modern Boy, and forerunner to The Champion - Boys' Magazine, all from the 1930s. The comics shown here date from the following decade, 1947 to be precise, at a time when the country was piecing itself back together following the end of the war, and old pre-war racing cars were being dusted down in readiness for limited competitive use, often on makeshift courses laid out on wartime runways. Fuel restrictions didn't help the racing driver's cause too much either, although most managed to find enough motor spirit to get their cars onto the starting line. The Champion was a weekly publication, with different exciting scenes being shown on the cover. Shown on the right are four copies of this comic from '47, also featuring the daring 'Hurry Scurry -The Demon Racer' in a couple of different racing cars. Issue 1,336 shows our hero leading a group of drivers on a banked circuit, being harried by three other drivers, the fourth seen mid-flight as his car makes a bid for freedom over the banking. Hurry Scurrys mechanics are doing an admirable job of waving 'their' driver on to the finishing line. There was a sound like a gun going off, as the tyre exploded. Jack Scurry was at the wheel of the hurtling Cyclone Special, which suddenly began to act like a wild animal. Hurry, who had earned his nickname in the days when he had been a fighter pilot with the RAF was living up to his name as he drove the racing car round the test track at the Cyclone Works. Hurry's foot was hard down when the tyre burst. Instantly the car changed from a smooth, high-speed, well-controlled machine into a screaming, leaping, rebellious mass of death-dealing metal...."
The story continues as it becomes obvious that the tyre was shot out by a hidden gunman - gripping stuff. The author, a John Marshall, may well have based some of his fictional characters on real-life drivers of the day, some of whom had flown fighters during the war and, on cessation of their flying activities, were eager to find a peace-time pursuit that gave them something approaching the 'buzz' that flying a single engined fighter must have given them. finest bicycle built today'. 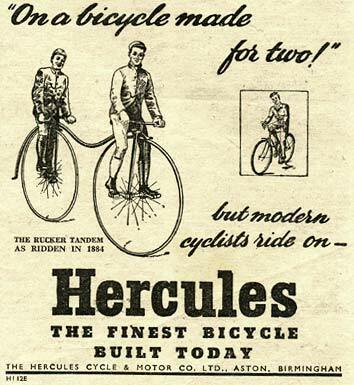 The Hercules Cycle & Motor Co. Ltd were situated in Aston, Birmingham. How difficult must it have been to climb on board the front seating position of this tandem Penny Farthing? I think riding a PF must be interesting enough, without the added excitement of having a passenger trying their utmost to de-stabilise progress. The other copies feature 'Hurry Scurry' in various racing scrapes, one pushing his car over the finish line, another showing him mid-accident, and the other showing a different car tackling a 'Wall of Death', something usually the preserve of Indian motorcycles I'd have thought. More motoring scenes from yesteryear. Further copies of The Champion with motoring content featuring in their cover artwork continue to turn up. The four issues below all date to 1948. The January 3rd issue sees Hurry Scurry, racing driver and former fighter pilot, taking to the track in his latest, pint-sized, Cyclone racing car. The car was designed with competing in a US midget racing event, due to take place at a nearby stadium. The January 24th issue sees Hurry behind the wheel of a more conventional racing car, while issue number 1,364 (March 20th) has an illustration of a sportscar in hot pursuit of a mono-wheeled car, or "monocar", being tested by Hurry. Needless to say things don't go to plan, and our hero is soon being pursued by dastardly types, intent on stealing the monocar. Several copies feature racing motorcycles on their covers, again under the control of "Hurry Scurry - The Phantom Speedman" (as opposed to "Hurry Scurry - The Demon Racer" in the car stories). The issue shown below is for May 29th, 1948. A copy of The Champion Annual (for 1956) can be seen on this page, again with a racing driver on the cover.